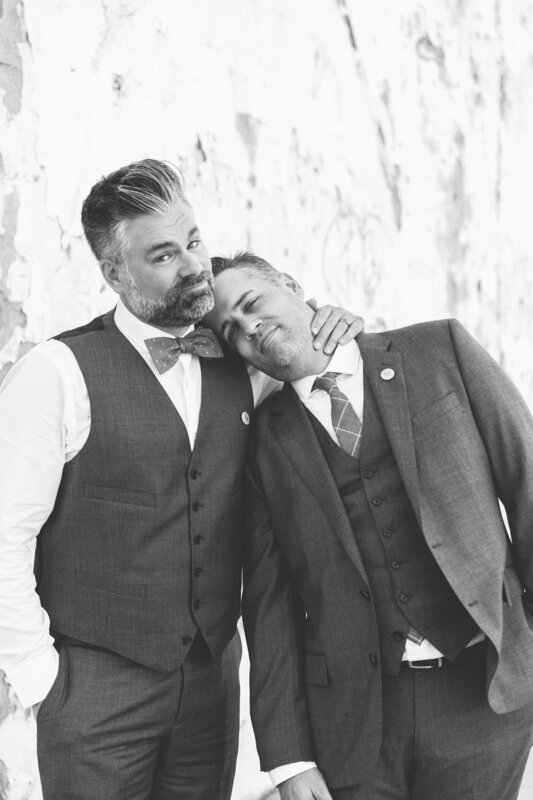 Hosts Jeff Bachman and Matt Barnes being VERY serious at their own personal photo shoot (aka- Matt's wedding). "A couple of guys who were up to no good..."
Yeah... they like The Fresh Prince. But, you know what Matt Barnes and Jeff Bachman love more than The Fresh Prince? The Bachelor. Matt Barnes (the one on the right) and Jeff Bachman (the one on the left with the incredible hair) are huge fans of The Bachelor, The Bachelorette and Bachelor in Paradise. Why? Because it's absolutely ridiculous and sometimes you just have to embrace the ridiculousness of life! But, being dudes... their love for The Bachelor was secret for fear of being mocked. NO LONGER! As of January, 2017, men everywhere can come out of The Bachelor closet and proudly proclaim "I watch The Bachelor!" That's what Matt & Jeff decided to do when they launched "Bros Before Rose: Men Who Watch The Bachelor." Each week, they watch the show at one of their homes and then discuss the train wreck they just witnessed. It's a way to process their feelings in a healthy way. (At least, that's what they tell themselves.) At first, their wives (Stacy and Shara) would chime in occasionally as well. Now they have microphones of their own and are the co-hosts of the show. Follow Jeff Bachman on Instagram @jbachman and on Twitter @DrBackpack. Follow the show on Twitter @BrosBeforeRose and Instagram @BrosBeforeRoseOfficial. "Bros Before Rose" is produced and distributed by Rogue Creative Development. You should check out their website too. They do cool stuff.